Natural aging. Aging makes teeth less bright as the enamel gets thinner and the dentin becomes darker. Thin enamel also makes teeth look yellow. Tooth enamel is the hard, white surface of your teeth, and underneath it is a pale brown substance called dentin. 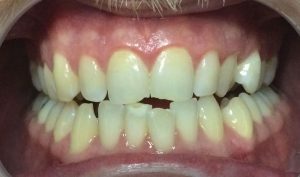 Thick enamel looks white, but thin enamel allows dentin tones to show through, making teeth look yellow from the outside. Enamel naturally wears thin as people age, but acids from foods and drinks such as sour candies, oranges and soda also thin the enamel by eroding its surface. Prolonged consumption of staining agents such as tobacco, coffee, tea, red wine, dark-colored soda, and staining foods like mustard, tomato sauce, or blueberries. A good rule to go by is that if it will stain a white handkerchief or white t-shirt, then it may similarly stain your teeth. It is also possible to have stains inside the tooth. These are called intrinsic stains. For example, intrinsic stains can be caused by exposure to too much fluoride as a child while teeth are developing. Other causes include tetracycline antibiotics. 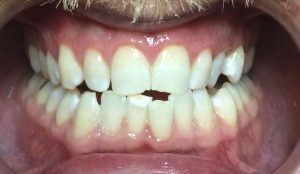 These types of “tooth-formation” stains do not respond well to any form of teeth bleaching. Trauma may also darken a tooth.